← A quick post before work…birdies! This show ended up being a number of firsts for both me and Mocha. 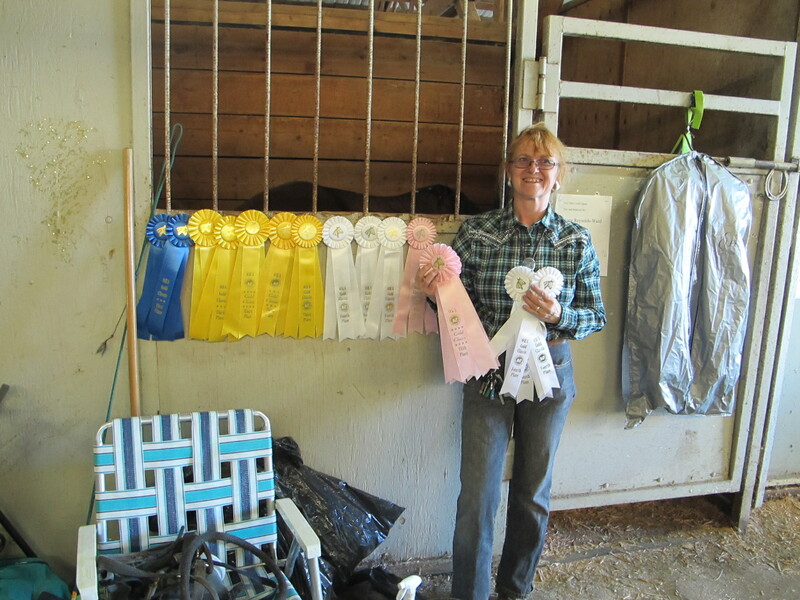 Some of the biggest firsts for her included her first overnight/multi-day show and her first trip to a show alone without a barn buddy. While we did several classes that were new to us (actually, the bulk of the classes were first timers), those two factors were really huge for her. There definitely was an adjustment issue, but not enough to throw off her ability to perform. 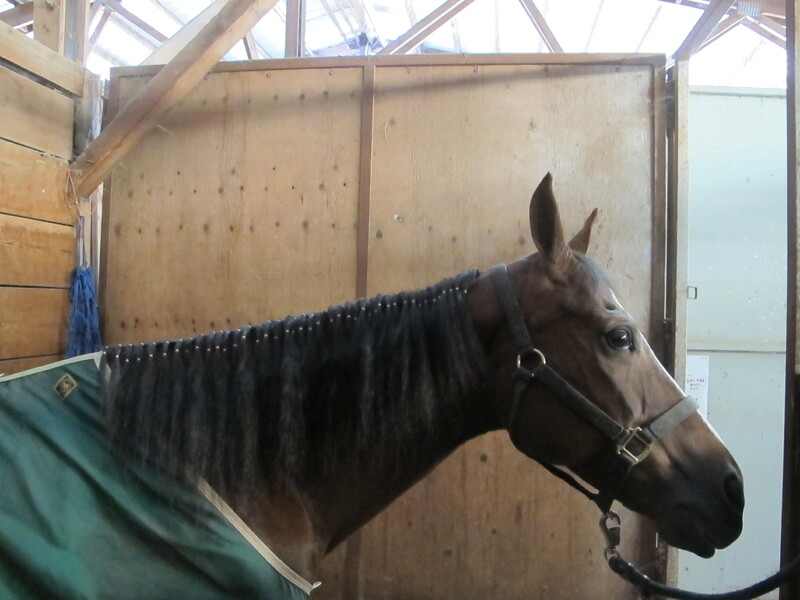 She was anxious, yes, but it was more of the same sort of anxiety she showed at her first show, where she screamed any time she went outside of the barn and away from other horses. 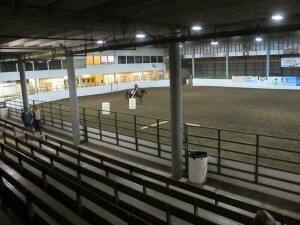 In the barn and in the arena, she did fine. 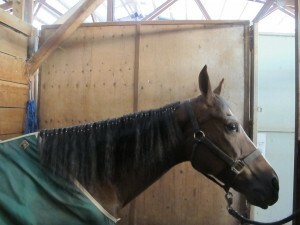 I got inspired by watching halter classes and banded her mane–a first for both of us. Instead of a single row of bands, I did a double row. Saw it on a little dun mare who was clearly a reiner type, with a mane like Mocha’s, and thought it looked cute. So I spent an hour banding her mane. It looked cute, was an attractive way to give her a little bit of a cultured look, and the bands stayed in all weekend with only a few falling out overnight. Win! The process also relaxed Mocha and sent her into drowsy mode. Girl does like her primping! I got further inspired and added 18 and Over Showmanship to our schedule. 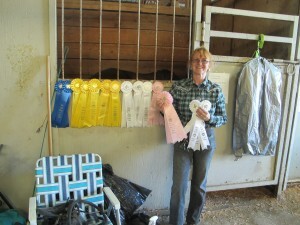 I figured we didn’t have a snowball’s chance of placing in the large classes, especially since Mocha’s not had formal Showmanship squaring up training and it’s been 38 years since I last did Showmanship, but I thought it would be a good way to expose her to the arena and to competition before In-Hand Trail. Um, well, despite her calling once, peeing, and being a little antsy, we got two fourth places (and I think a fifth, can’t remember now). Trail ended up being pretty exciting. The course was deceptively simple, with a gate, a mailbox, a water obstacle using a tarp, sidepassing a L, and walking a pole around a barrel. The complicating factor was the transitions and space between obstacles. Gate to mailbox was walk. NBD. Jog 20 feet to tarp. Bit of a challenge. Lope 25 feet to the L. Now that was tight. Even little short-coupled Miss Mocha found it tight. Luckily, she’s sensitive enough that I could halt her right at the edge of the tarp (as shown in the pic) so we could pick up the lope, get in two-three strides, and stop right at the L.
This was the challenging obstacle. Two barrels and an eight-foot piece of molding with attached handle. You had to ride up to the side with the handle, pick it up, and walk around the barrel to replace it without allowing the molding to fall off of the barrel. It helped that Miss Mocha seemed to have been watching the other horses doing the course and knew That Thing Is Not Supposed To Fall. She watched it closely and we did well. Namely, two blues, several thirds. 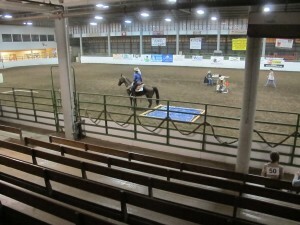 Then it was on to the Reining classes. When I lined Mocha up to wait for the starting whistle, things narrowed down around me. We launched into a lope and I kissed her up to a full gallop. The first couple of strides, she was hesitant, then she dug in and went for broke. As we sizzled around the first corner heading for the rollback, I felt my hat wobble. Semiblah rollback, around at lightspeed for the second rollback, then the large fast circles. Mocha was going for broke, thundering hard but steering well. As we went by the gate, I flipped my hat off so I wouldn’t keep thinking about it. G said he knew then that I was going for broke. Which we did. We flew around the large fasts, then checked for small slows, the flying change, and back to the large fasts, with another nice small slow, then on for the last build for a hard stop, backing up at least 20 feet, and spins. About halfway through the first run, I started hyperventilating and gasping. I think I’d been holding my breath until then. Afterwards, the runner, who’s a barn rat from our barn, came up to us and said “Dayum. You guys were smoking out there!” I thanked her as I choked on my asthma inhaler. Second run was much the same, except I bagged the hat from the beginning. And kinda sorta remembered to breathe. On the third run, Mocha bagged out of the spins. She’d been a little off on the rollbacks, but she flat out objected to the last spins and sidepassed to the wall. I didn’t push but took the DQ as I figured she had a reason–soreness or something–and I wouldn’t push it. Later, I found that we’d been at the top of all three judges’ cards until the spins. First one, I went five spins. Second one, I went three. Four was the correct number, and only four were allowed. Oh well. By this point it was nearly midnight. DH and I thought we’d unsaddle her by the car, so as not to have to lug the saddle to the car. Point of having a horse, right? Well, uh, no. She was convinced there were Horse Eating Monsters in the parking lot and she wasn’t going to have it. So I took her into the barn, where she calmed down. 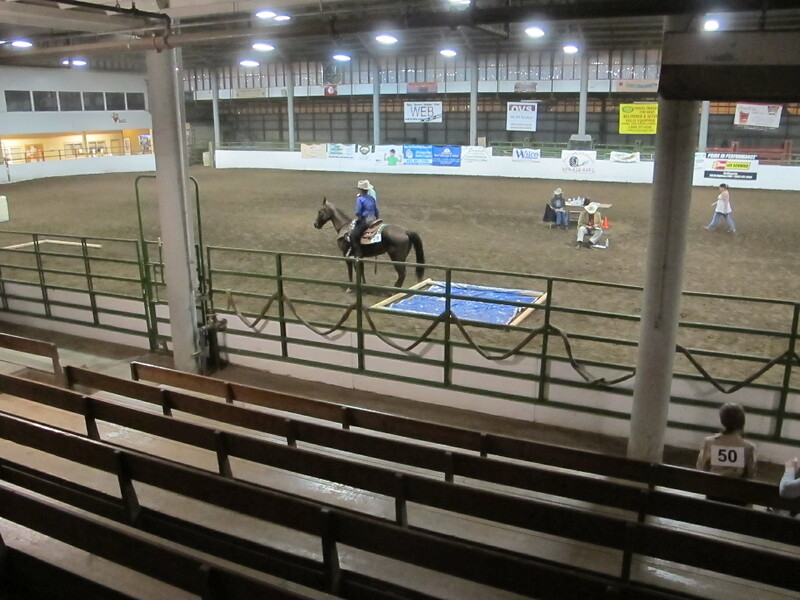 Fed her, put the Back on Track boots on, watered her (I’d watered her during the competition, during the Trail class breakdown–basically, took her back to the stall, dropped the bridle and let her drink). Headed off to the motel, worrying that she’d colic or freak out about the hock boots. In the morning, the main thing was that she was hungry. And she Did. Not. Want. Botheration while she ate. She was a little sore in her chest but the hocks were good. We went on to pick up several more fourths and fifths, as well as a couple more thirds. There’s the final ribbon pic. Two firsts, five thirds, six fourths, and three fifths. She was pretty funny when she got home. 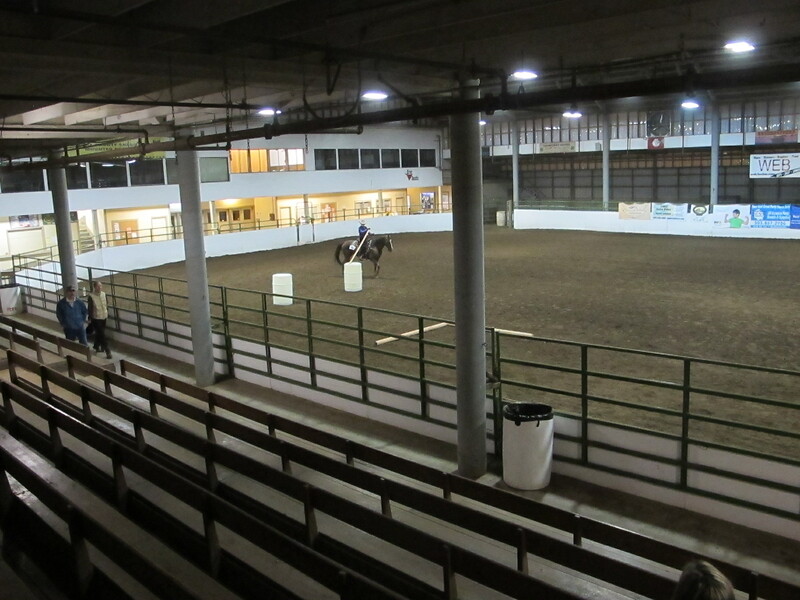 Eager to go in the arena, she had to amble around for about ten minutes before she finally dropped and rolled. 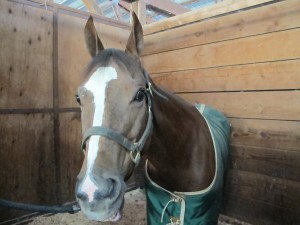 Then she was ready to go back to the stall. This post is long enough, I’ll write more about training and Pleasure later.